The great news today is that the Taliban has released the final three hostages they have been holding captive for the last six weeks. I've linked below some of the news agencies and their coverage of the story. The Taliban freed four women and one man hours after releasing a first group of three women. The hostages were handed over to tribal chiefs in southern Gazni province Wednesday and then to Red Cross officials. Taliban officials said the rest would be freed shortly. Provincial Governor Merajuddin Pattan told VOA he was confident the crisis was now over. "Within three days the whole number will be released," he said. Please keep praying until the rest are released. And thank God while you're praying because He hears the cries of His children. The Martyrs' monument encourages us to remember martyrs and to be encouraged by their inspirational testimonies of faith in Christ. Click here to see more pictures of this beautiful memorial. “In that huge convention center with hundreds of displays, the one that sticks in my mind was done by Voice of Martyrs. It centered around a glass tomb with a shrouded figure representing the body of a martyr. Above it were the names of martyrs from all over the world, some going back to the early church, some who died in 2007 in different parts of the world.” The display included Ron DiCianni's painting Safely Home (used as an inside cover in Randy's book by the same title). More than 70 million Christians have been martyred for their faith since 33 AD. This year an estimated 160,000 believers will die at the hands of their oppressors and over 200 million will be persecuted, arrested, tortured, beaten or jailed. In many nations it is illegal to own a Bible, share your faith, change your faith or allow children under 18 to attend a religious service. Nations where Christians are frequently persecuted include Afghanistan, Bhutan, Colombia, Iran, Laos, China, Nepal, Syria, Turkey, and many more. " 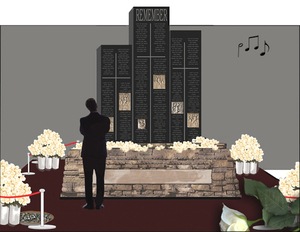 If you want to learn more about the monument, please visit www.martyrsmonument.com and tell a friend. And we would like to thank Randy for sharing his experience with his ministry and blessing us as a result. Amen! South Korean Hostages to Be Released... Maybe? One of the reasons I love the medium of blogging is because it's totally interactive, and I have to tell you that even before I got out of bed this morning, I received a few emails telling me that the Korean hostages may be freed by the terrorist Taliban. What a great way to begin the day! According to BBC News website the Taliban has agreed to free the Korean hostages. But you may be wondering why or what the "catch" is. Afterall, terrorists aren't going to free their hostages and expect nothing in return, and especially after murdering two of the missionaries in cold blood. Seoul said the agreement was reached on condition its troops were withdrawn as scheduled by the year's end. South Korea also agreed to end all missionary work in Afghanistan and stop its citizens from travelling there. The BBC's Alastair Leithead, in Kabul, says no exact release date has been given, but the Taleban have said they will start working straight away to free them. There has been no mention of money being paid, our correspondent adds, but it is thought that a ransom may have been part of the deal. I have two comments about this. First, we do not know the date, and I'm not quick to jump up and down and rejoice because of that one simple point. The reason is because we are dealing with terrorists, and well, terrorists don't fight fair. And well, they aren't always honest. So, at least for me, I'll rejoice once the hostages are set free. My second comment concerns the ransom part of this. I'm not an expert on South Korean relations and their policies on paying ransom, but I know the USA has a policy not to pay ransom. So I'm skeptical about ransom being involved. And while I do rejoice that the hostages may be freed by the Taliban, I'm going to hold my excitement and joy until I see it. Which brings me to a new prayer request - pray that the hostages would be freed and that the Taliban keep their word. And let's even step out and pray that missionaries would continue to enter Afghanistan and minister even though the South Koreans are agreeing to stop sending missionaries there. We must remember that God told us to GO into ALL the world, not just the countries who want us there. And like it or not, the Taliban cannot and will not stop God from spreading His word. So we need to be praying that the Lord would raise up more bold and courageous saints who would dare to enter a country where militant terrorists want to rule the day. Here are a few other places covering the story. Most have the same information. It is incredible how unless you are involved with people actively ministering to persecuted believers around the world, you may have no idea that this year’s International Day of Prayer for the Persecuted Church is November 11, 2007. I had never heard of IDOP until I got in contact with The Voice of the Martyrs. I believe it is imperative for us to get as many people as possible praying year-round for our brothers and sisters around the world, and I believe November 11, will be a great day to invite others to join in prayer for these courageous believers. This video is very thought provoking and I want to hear your responses to it. So the comments are open, please share your feelings after viewing. The video is about 6 minutes, so take that time, sit back and watch with your heart open. All comments are moderated before they appear. This is a news brief from our friends at Compass Direct News. To read the full story click here. LOS ANGELES, August 23 (Compass Direct News) – Christians in Eritrea confirmed yesterday that a pastor in Asmara who disappeared 11 days ago remains missing. Pastor Leule Gebreab of Asmara’s Apostolic Church failed to return home to his family on August 12. “His wife is greatly distressed about his disappearance,” a local source told Compass. Gebreab, 35, is married with two children. In a separate development, Eritrean authorities issued an ultimatum to Catholic church leaders on August 16, ordering that all the church’s schools, clinics, orphanages and women’s vocational training centers be turned over to the government’s Ministry of Social Welfare and Labor. More than 2,000 Eritrean Christians remain locked up and subjected to severe torture for their religious beliefs. A Kale Hiwot Church pastor and 20 members of his congregation arrested in the town of Dekemhare in late May and early June have yet to be released from custody. But the Rev. Zecharias Abraham and 80 worshippers at the Mehrete Yesus Evangelical Presbyterian Church, who had been arrested during Sunday services in Asmara on April 29, were all reported released during the fourth week of May. I have to be transparent and say that I was brought very closely to tears as I watched this moving video. Please watch it, and if you feel so led, put it on your blog too. Other coverage on the situation is being done by bloggers. One such blogger is Eugene Cho . He has a great run down. Today there isn't really much new information concerning the South Korean hostages held by the terrorist Taliban. But what we've found is that according to the english.chosun.com the Afghan government is said to be forming a special committee to solve the problem. Afterall, when all else fails, form a committee. In fact, I know a great joke about committees, but I'll spare you because it's a groaner. And on a completely different note, the Baptist Press is looking at this issue and trying to determine what the future of missions will be for the Koreans. But as Korean Christians pray, church and mission agency leaders are struggling with how best to adapt to environments and cultures where a Christian presence is unwelcome and often dangerous. They are discussing how best to complete the task of taking the Gospel to "the ends of the earth," while protecting those under their watch who have been called to difficult places. And, at the request of the Korean government, plans are underway to remove all Korean Christian workers Afghanistan. Keep on praying everybody because the Lord knows what He is doing with this situation, and I think that one thing He is doing is raising awareness about this part of the world. That's good news, and we know the Lord will have the ultimate victory in this situation.